Glide through your busy day calmed by the fragrant scent of a summer garden in full bloom when you wear L'Extase Caresse de Roses. 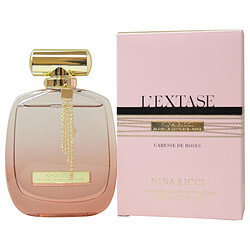 The house of Nina Ricci released this intoxicating floral fragrance for women in 2016 in celebration of the irrepressible feminine spirit. Exotic notes of Bulgarian and Turkish rose surround you with a sweetness that's fresh but not overpowering. Soft aromas of violet and peony smooth out the bouquet, adding balance and harmony. White musk on the base ties a sophisticated bow around this alluring scent.